Several common trees have thorns. Thorns are a defense mechanism evolved by them and are actually modified branches. You can tell these thorn trees apart by examining various aspects of their appearances. Hawthorn, Russian olive, honey locust, Osage orange, American holly, crabapple, and American plums are all commonly found in North America. 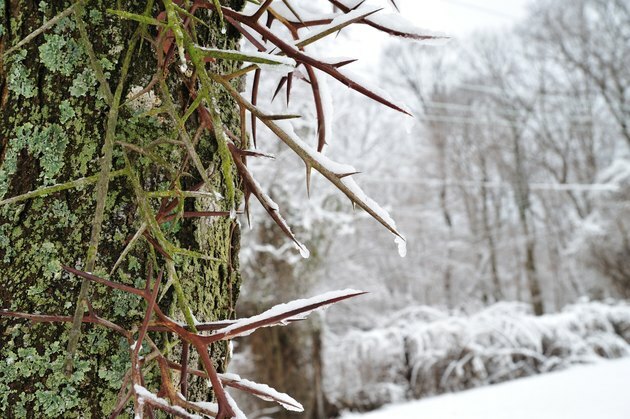 Thorns on a Honey Locust tree in winter. 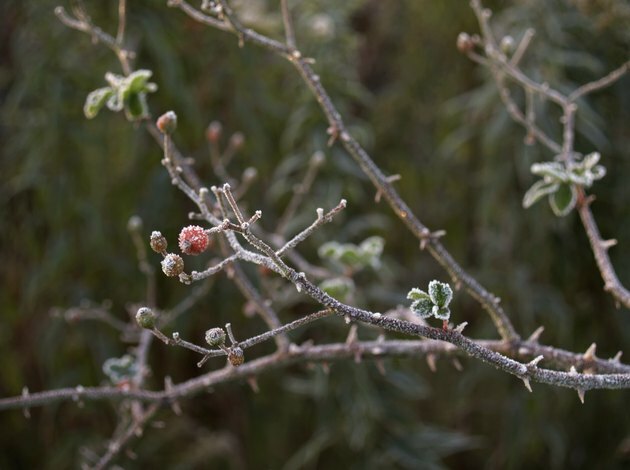 Thorns on a frost covered Hawthorn tree branch. Look at the placement and size of the thorns. 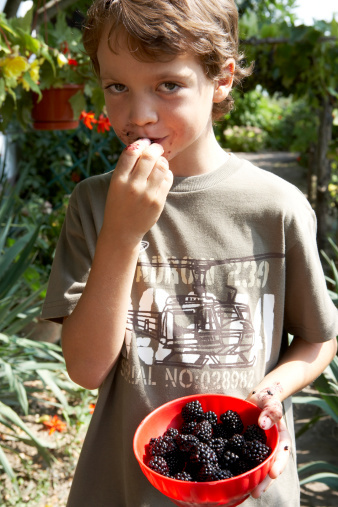 Long, straight or slightly curved thorns on the branches indicate a Hawthorn. Short to medium-length straight thorns indicate the Osage orange. Honey locust thorns are branched, and are found in clusters on the trunk. 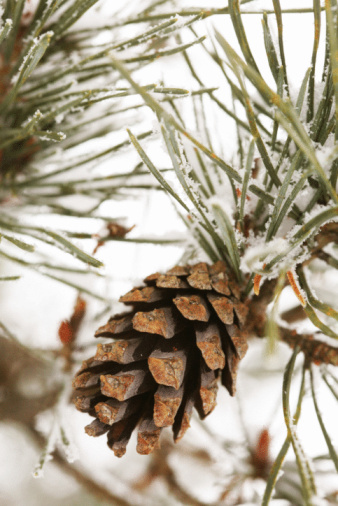 Russian olive tree thorns are found on the ends of its twigs. American plum trees grow thorns on their small branches. Short, rough thorns on the branches are typical of crabapple trees. The thorns of the American holly grow on the edges of its leaves. Leaves and red berries on the branches of a Holly tree. Look at how the leaves of the thorn tree are shaped. Oval leaves that are notched or lobed indicate a Hawthorn tree. Oval leaves with smooth edges are typical of Osange oranges. The leaves of the honey locust are several inches long and made up out of two rows of smooth-edged oval leaflets. Russian olive leaves are long, narrow, light green above, gray underneath, and covered with silvery scales. 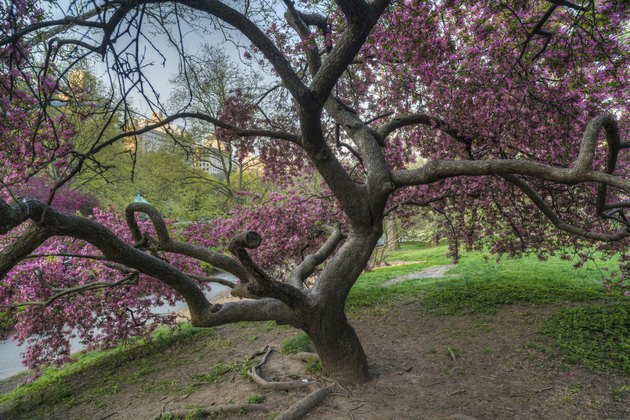 The American plum has serrated leaves with a "V"-shaped base, much longer than they are broad. Crabapple leaves have broad bases, serrated edges and come to a point at the tip. 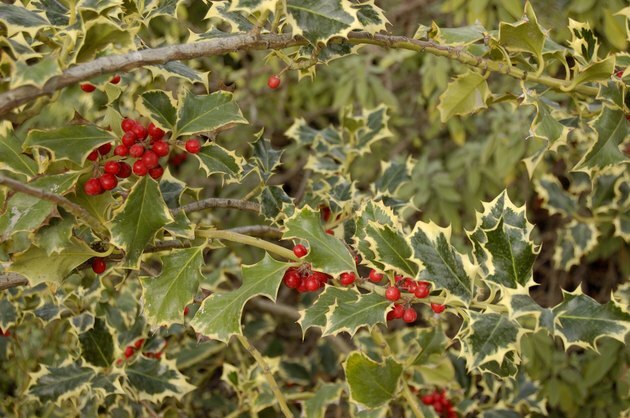 Holly leaves are oval, green, sometimes with brown margins, and have thorns on the edges. A crab apple tree grows along the bank of a river. Look at the tree bark's color, texture and pattern. Hawthorn bark is gray, brown or red. It is smooth on younger trees and becomes scaly as they age. The bark of the Osage orange ranges from gray-brown to orange-brown in color, and is scaly and fissured. Honey locust bark is rough and gray. Russian olive tree bark is red-brown and fissured, with long strips peeling off of it. Young American plums have reddish gray bark with small horizontal ridges. Older plums have gray bark with deep vertical ridges and peeling strips. Crabapple bark tends to be smooth and red to brown in color. American holly has smooth bark when it is young. This bark becomes covered in wartlike growths as the trees age. Holly bark is light gray or white. 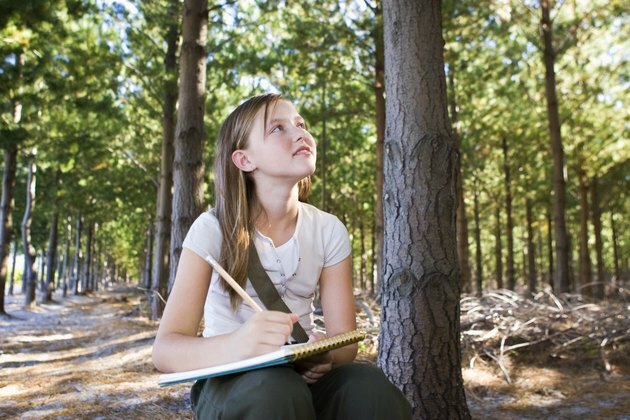 A girl sits on a stump while studying trees. Write a list of each aspect of the tree's appearance. Write the possible candidates next to each item on the list. If most of the features of the tree indicate the same species, then you can be confident that that is the species of the tree that you are studying.